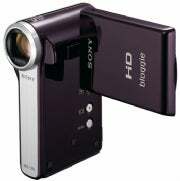 The Sony Bloggie MHS-CM5 ($200 as of April 30, 2010) distinguishes itself from competing pocket camcorders with a pistol-grip design, a 5X optical zoom lens, and a dual memory-card slot that supports both SD/SDHC cards and the MemoryStick format. It shoots reasonably good video and has some nice features, but ultimately it doesn't set itself apart from the crowd in the area of performance. Unlike most pocket camcorders in stores today, the Bloggie MHS-CM5 looks like a miniature version of a full-size camcorder. And along with its candy-bar-style cousin, the Bloggie MHS-PM5, it's among the first Sony pocket camcorders to shoot 1080p-resolution high-definition video. Both Bloggie models are follow-ups to last year's Webbie camcorders; Sony has simply renamed its pocket-camcorder line. Aside from having a unique design, the Bloggie MHS-CM5 is noticeably bulkier than most pocket camcorders. It has a built-in USB connector that swings out from a compartment on the side of the camera--a welcome improvement on last year's Webbie models, which used a separate USB cable to offload footage and charge the camera. Because of the camcorder's generous size, its USB connector may have a bit of trouble fitting in some port configurations. Fortunately, Sony includes a female-to-male USB extension cable to alleviate such woes. The Bloggie shoots 1080p MPEG-4 video captured at 30 frames per second--as well as 720p video captured at 60 fps and 30 fps, 640-by-480 VGA video taken at 30 fps, and 5-megapixel still photos. There's about a second of shutter lag between when I pressed the shutter button and when the Bloggie captured an image, but the image quality is decent and the camcorder's SteadyShot digital stabilization does a good job of reducing any associated shakiness. Video performance is decent, as long as you're in a well-lit setting. In bright indoor lighting, the Bloggie's 1080p video is a bit darker and somewhat less sharp than output from two competing 1080p pocket camcorders, the Kodak Zi8 and the Toshiba Camileo S20. The 5x optical zoom lens is a great spec for a pocket camcorder, but the Bloggie didn't offer nearly as much coverage on the wide-angle end as our wide-angle winner, the Creative Vado HD. Autofocus has a little trouble at the telephoto end of the zoom, but it ultimately locks in on a sharp image after a second or so of searching. Also, the zoom is the smoothest we've seen on a pocket camcorder, by far. Shown below are the results of our standard pocket-camcorder tests. Wide-angle coverage is on a par with that of the Kodak Zi8, but footage shot with the Bloggie showed shadowy bands scrolling upward over our test footage. In low light, the Bloggie produced grainy footage that had a yellow tint, without much color accuracy. Compared to excellent low-light performers such as the third-generation Creative Vado HD and the second-generation Flip MinoHD, the Bloggie shot noticeably lower-quality footage in dark settings. The Bloggie reproduced loud and clear audio, and it didn't show the same oversensitivity to hand movements that last year's Bloggie MHS-PM1. That said, the built-in microphone remains sensitive to wind, and overall audio sounds a bit hollow. The Bloggie doesn't offer the external mic-in capabilities of the Creative Vado HD or the Kodak Zi8, so you're stuck with the onboard mic. Despite its underwhelming video performance, the Bloggie MHS-CM5 has a lot of features to like. Flipping out the camcorder's 2.5-inch LCD screen powers on the camcorder, and flipping it closed turns it off--a much faster process than pressing a power button. During filming, the camcorder's face detection option lets you optimize in-camera exposure settings, and its SteadyShot stabilization is probably the best stabilization mode we've seen in a pocket camcorder. But the Bloggie's impressive design and spec sheet don't enable this pocket camcorder to catch up with competing models entirely. It's a good option for anyone seeking a pistol-grip-style unit that supports both SD cards and MemoryStick cards, but video quality is mediocre in both bright light and low light. Other than its 5X optical zoom, the Bloggie MHS-CM5's features aren't radically superior to the competition's, and it certainly doesn't outperform existing high-definition pocket camcorders in terms of video quality. The 1080p-shooting Sony Bloggie MHS-CM5 has a pistol-grip design and a 5X optical zoom lens, but it doesn't match the performance of similarly priced pocket camcorders.